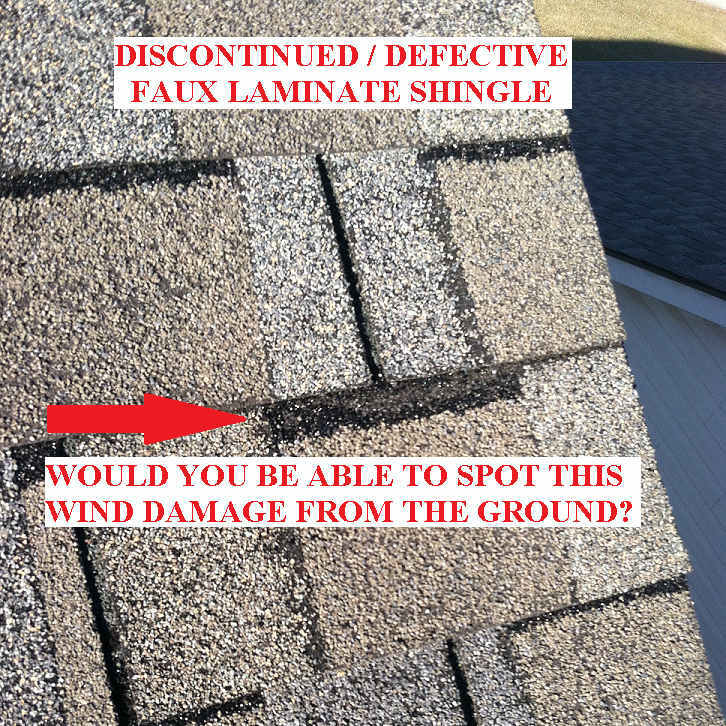 Does your home in Lexington, KY have discontinued or defective shingles? Many homeowners are unaware that the only thing protecting their home from the elements such as rain, snow, wind and hail is a defective and discontinued shingle. These are otherwise known as the “Faux Laminate”. Call us to see if you’re entitled to a new roof! Many are also unaware of exactly how their insurance coverage works when it comes to repairing and replacing damaged shingles that are no longer in production and have no “like, kind, size and quality” match available. For more information on insurance related repairs visit “Choosing The Right Insurance Contractor in Lexington, KY“. The reason these shingles were discontinued was due to their inherent defect. The Fiberglass Horizon Shingle, manufactured by Certainteed starting in 2005 was soon discontinued due to craze and thermal cracking. 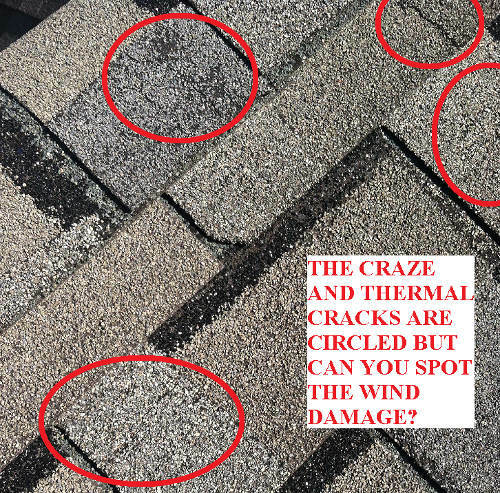 Craze and thermal cracking is when the volatiles in the compounds used to manufacture the shingles are heavily depleted and the rest of the shingle can no longer expand and contract properly with the changes in temperature. So why should anyone care about this defect? The answer is simple; when the shingle starts to crack, the UV protective granules become dislodged from the matting of the shingle and allow the sun’s rays to penetrate the shingle. Ever leave something out in the sun for an entire season that isn’t designed to resist that level of exposure? If yes, then you understand what I’m talking about. The matting of all shingles, discontinued and still in production, is not designed to handle a constant exposure to the sun’s rays. It deteriorates over a short period of time and soon starts to, well, fall apart. This is one reason homeowners are entitled to a warranty shingle replacement in Lexington. Take this one example and add the fact that these shingles were also allegedly manufactured incorrectly, causing the volatiles to deplete at a much more rapid rate than their competitor’s alternatives. These shingles were designed to “mimic” the true dimensional shingle to save builders and Homeowners money. By mimicking the dimensional shingle, Certainteed could charge standard 3-tab prices and still advertise the same way that Owens Corning could advertise their dimensional/architectural shingles. One problem… The added layer of granules that was glued directly to the original layer without any additional matting only exacerbated the problem with rapidly depleting volatiles. This turned a shingle that was manufactured and sold with a 30 year warranty into a 10 year shingle in most areas and a 4-5 year shingle in harsher climates. Bingo! There’s the problem. So what did Certainteed do about this when everyone started cashing in on their warranty? They discontinued the sale of the shingle to get out of further warranty claims. What does that mean for you if your roof becomes damaged by wind or hail, even in the slightest? It means that your insurance carrier is going to most likely be forced to replace the entire roof. The reason is due to the inability to locate a “Reasonable Match”. Most insurance policies have this exact terminology written into them; “Like, kind, size, shape and quality.” This means that you are most likely ENTITLED to a full roof replacement with all the bells and whistles that come with it! 1. You’re living under a ticking time bomb and if you don’t cash in on the benefits YOU PAY FOR, it is only a matter of time before YOU are stuck with that hefty $10,000 bill to replace the roof. 2. Insurance carriers are supposed to check your property every so often to determine the rate for your level of coverage and why. Have you ever seen them come and do this as you faithfully pay your premiums? I haven’t. Call Us @ 859.368.6346 Before A Costly Mistake Is Made! Also, having a roofer or roofing contractor repair or replace a few shingles with a non-matching product actually destroys your chances of ever having the insurance company replace the entire thing because by doing so, you give them a scape goat. When I arrived to look at the roof, yes, there was valid damage. But because the roof didn’t match to begin with, I am not obligated to make it match. Here’s your claim award and no, it doesn’t exceed your deductible. So here’s $0 and by the way, fix your roof before we drop your coverage. Have a nice day! Nobody wants to hear this when it comes to their most expensive aspect of their home. So, when you get tipped off that you have a discontinued roof and you want to save $10,000, skip the minor repair and have it checked out by a professional at Lexington Blue. Our process checks to see whether or not you have damage that your insurance carrier may be liable for. Chances are that you will save money and get to start over with a reputable shingle that is still in production with valid 30-50 year warranty coverage.